After the launch of the first humans into orbit, it became obvious that human (and animal) bodies cannot be separated from Earth’s magnetic field, without dire consequences. On April 12, 1961, Yuri Gagarin became the first human to journey into outer space, and when he and subsequent cosmonauts – as well as American astronauts returned to earth, they were very sick and their strength and energy was depleted. NASA studied the problem for several years and eventually determined that the problem was that the astronauts had been cut off from the earth’s magnetic field. Once NASA equipped space capsules with Pulsating Magnetic Fields, the astronauts no longer faced the same problems with sickness and lack of energy. Research into the effects of PEMF (Pulsed Electro Magnetic Fields) became an urgent priority at NASA. NASA (National Aeronautics and Space Administration) invested $3.5 million into four years of magnetic therapy studies. NASA has concluded a number of studies on magnetic therapy, which is officially known as Pulsed Electromagnetic Field Therapy (PEMF). NASA spent $3.5 million over a period of four years studying Magnetic Therapy and developed its own PEMF devices. 1. Magnetic therapy is effective in healing refractory broken bones — bones that are unable to heal despite repeated surgical procedures. 2. NASA also found magnetic therapy is successful in developing tissues for transplantation, repairing traumatized tissues, and moderating some neurodegenerative diseases such as Parkinson’s and Alzheimer’s. 3. Previous studies also suggest that PEMF might be useful in the treatment of some muscle disorders. NASA discovered that the benefits of low frequency, low intensity, rapidly varying PEMF includes better healing and regeneration of damaged or diseased tissue, greater cell longevity, accelerated cell growth, improved cellular voltage (mainly observed in nerve cells), upregulation of genes related to collagen production, cell restoration and growth. NOTE: upregulation is a mechanism that increases the creation of certain gene products. This study is a landmark in proving the efficacy of PEMF therapy on human cells for healing, growth and regeneration, specifically human nerve cells. These findings confirm that the human body needs frequencies and intensities close to what the earth provides, along with a rapidly varying waveform. NASA scientists’ ultimate goal for magnetic therapy is to create an astronaut suit that would provide a countermeasure for the muscle atrophy and bone loss associated with space flight. 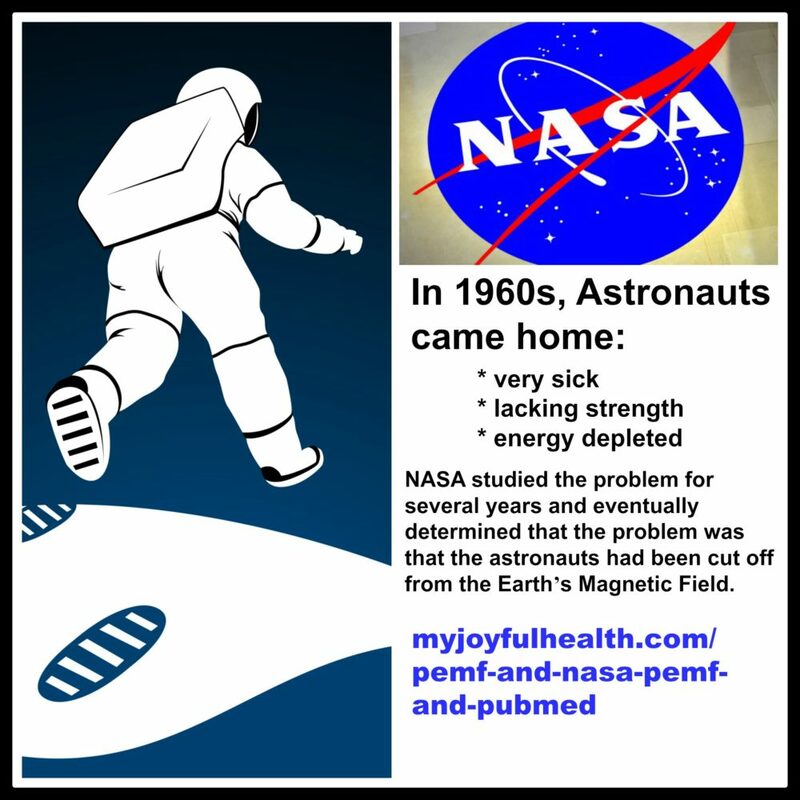 NASA’s findings in regards to Magnetic Therapy to sustain astronauts’ well-being while in space have been instrumental in validating ongoing scientific studies and the development of PEMF devices. Once NASA equipped space capsules with Pulsating Magnetic Fields, the astronauts no longer faced the same problems with sickness and lack of energy. If you’re facing problems with sickness or lack of energy, then you might want to consider using a PEMF mat since studies have shown that PEMF therapy promotes and maintains general cellular health and function. On earth, PEMF is effective in the treatment of various muscle diseases, age-related muscle atrophy, osteoporosis and other bone diseases. Currently, the Food and Drug Administration has cleared magnetic therapy for fusing broken bones, treating severe untreatable depression, and post-operative pain and swelling. While NASA has its own PEMF devices, our solution for home-based PEMF Therapy is the Swiss Bionic Omnium1 Mat, which promotes and maintains general cellular health and function. To see the complete research abstract from the following examples go to https://www.ncbi.nlm.nih.gov/pubmed/ and put the PMID number in the search box. That way you can see where the original research is located.